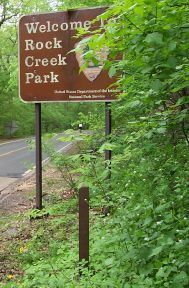 Rock Creek Trail begins at the edge of Rock Creek Park , where Beach Drive crosses the DC line and enters Maryland. The RCT is a beautiful paved pathway shared by perambulator-pushers, walkers, runners, cyclists, skaters, and (in a few segments) horses and their riders. All-weather water fountains are placed every 2-3 miles along the route; they generally work well unless temperatures are far below freezing. Water is available in the initial mile near the tennis courts at the "Candy Cane City" playground. The first mile of RCT has been rerouted and lengthened over the years to curve around various ballfields and playgrounds. 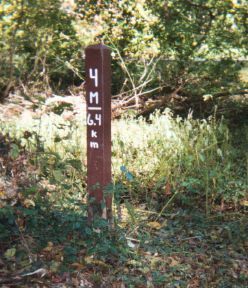 The result of these modifications is that the Mile One marker had to be moved a few hundred yards south of its original site. It now stands just outside Meadowbrook Stables. 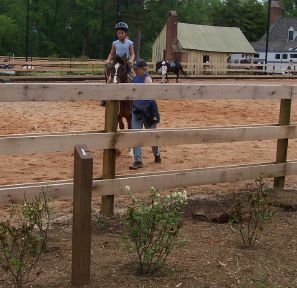 When the barns are open, water and other conveniences may be available inside. 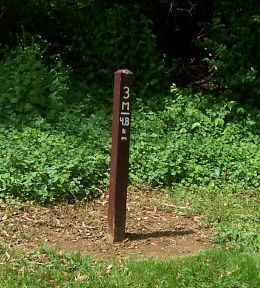 In measuring distances traveled, remember that the gap between Milepost One and Milepost Two is approximately 1.2 miles. After crossing East-west Highway RCT passes by the Ohr Kodesh Congregation  synagogue (please be quiet on Saturday mornings!) and through Ray's Meadow Park, where a good water fountain and porta-john are positioned near the 1.25 mile marker painted on the asphalt. At the 1.5 mile point the trail passes under a magnificent wooden trestle which once carried the Georgetown Branch railroad line across Rock Creek. See the Capital Crescent Trail web site  for history, photographs, and further details. RCT continues northward and after another quarter mile crosses a wood-and-metal bridge over the water. On the upstream side of both ends of that bridge there begin a pair of unpaved trails, marked with bright violet blazes, that wind through sometimes-rough and overgrown terrain. The two legs of this "inner purple line" proceed on either side of Rock Creek to rejoin at another footbridge inside the Capital Beltway. Rock Creek Trail meanwhile wends its way farther from the stream as it passes behind various residential back-yards, through dense pine woods and occasional marshy areas. 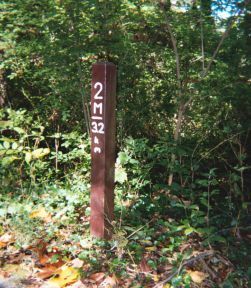 A well-marked side trail on the west leads to Woodend Sanctuary , a nature center owned by the Audubon Naturalist Society. Beyond the woodsy route to Milepost Two, RCT goes through some small valleys and emerges to run through open spaces between the creek and Beach Drive. The path crosses the street and, at about the 2.6 mile point, passes under the Capital Beltway. RCT then turns west to follow Beach below the looming spires of the "Mormon Temple" . A roadside path up the hill leads to the Temple parking lot entrance. At Old Spring Road, just after RCT crosses to the other side of Beach again (about the 3.9 mile point) another water fountain is situated. See DC Metro Area Trails: GPS Waypoints for a zoomable map showing the locations of GPS waypoints taken by ^z at every milepost along Rock Creek Trail, plus other landmarks. The map links in the image descriptions above have been tweaked to correspond to true milepost locations as depicted on Google Maps.